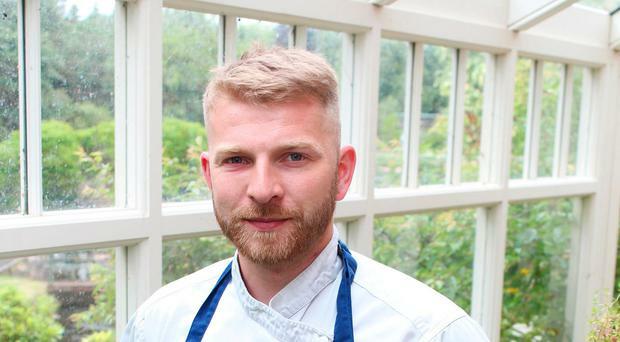 The 31-year-old father of three is head chef at award-winning 3AA Rosette River Room Restaurant at Galgorm Resort and Spa, Ballymena. Passionate about homegrown produce and culinary excellence, Chris couldn't see himself anywhere else, but behind the pass. A: Working long shifts means making time for exercise can be difficult, but I always try to get into the gym at least two or three times a week. The kitchen is such a fast-paced environment and you need to be feeling your best to produce the best, so I strongly believe having a healthy body helps maintain a healthy mind. Q: What's the worst illness you have had? I've been very lucky that I've never been struck down with any major illnesses, so the worst would be a bad cold... sometimes called man flu! A: I would say it's 50-50. When I am off work, I try to make healthy meals, using fresh ingredients, and I have a real passion for home-grown produce. I will admit, though, I'm not good all the time and I love to indulge every now and again. It can be hard not to treat yourself when you are surrounded by delicious food every day. We aim to offer a memorable dining experience here at the River Room Restaurant, Galgorm - we are one of only four restaurants in Northern Ireland to be awarded 3AA Rosettes for culinary excellence. Our menu showcases local artisan producers and we change the menus daily - we have carefully-selected local suppliers and our own kitchen garden too. A: I enjoy a drink from time to time, but I drink so little, I'm not really sure that it qualifies as a bad habit. I do stick to just a few because dealing with a sore head the next day just isn't worth it anymore. Q: Do you drink and/or smoke - if so, how much? A: I smoke a little, but I've been making a real effort to cut down. Q: Do you take any health supplements? A: The only supplements I take are protein shakes after the gym, which I find give me a boost after a workout. I eat a balanced, healthy diet, so I get the vitamins and nutrients I need from the foods I eat. A: It's so important to have a work-life balance and with such a busy job, I love getting some downtime and a chance to socialise. Most importantly, I love spending time with my boys and getting some quality time doing fun things with them. After that, it's the gym, a good box set or movie and catching up with family and friends. I also have a passion for riding motorcycles. Nothing comes close to that feeling of freedom and head space you get out on the open road. A: Too well. After a crazy shift, I'm out like a light. I try and get at least eight hours sleep every night or I find I'm tired and lacking energy. A: Turning 30 definitely makes you think about your future and the next chapter in your life, but I can say I'm not worried in the slightest. Although I loved my 20s, I am looking forward to what my 30s have in store. Q: What is your go-to product/habit that keeps you feeling healthy? A: It's hard to narrow it down to just one, but I would have to say exercise. The health benefits that it offers, not only physically, but mentally as well, should be reason enough to exercise. It acts as a stress reliever for me personally and I think people underestimate how important it is.